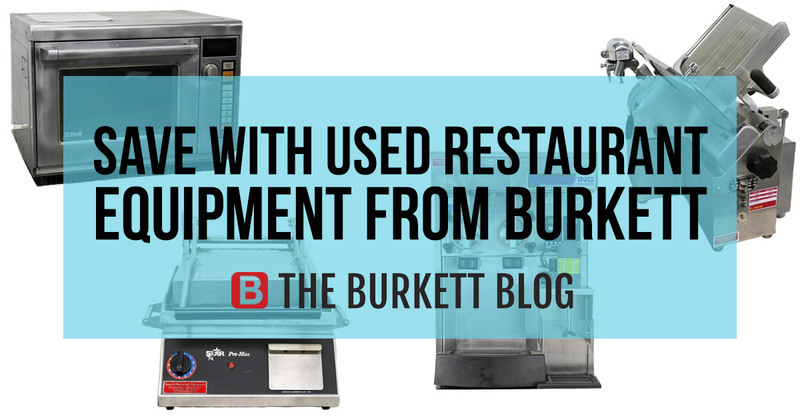 Refurbished goods are what got us started in this business, and has made Burkett Restaurant Equipment one of the largest and more reputable dealers of pre-owned commercial restaurant equipment in the U.S. It has been our specialty, since 1977! We’ve created our own “certified” process to bring you the best used equipment on the market. All used equipment comes with a Burkett 90-Day Warranty, and each piece of equipment is given a final certification test before it leaves our building. For example, our used cooking equipment is put through a series of rigorous tests prior to being available to our customers. We give the utmost attention to the heating elements, as we know the reason behind any good cooking product is the efficiency, fast production, and dependability. Each item is thoroughly cleaned, detailed, and major cosmetic issues are repaired, and every used equipment purchase is shipped with a Burkett product specific guide that provides you with everything you need to know about your purchase. 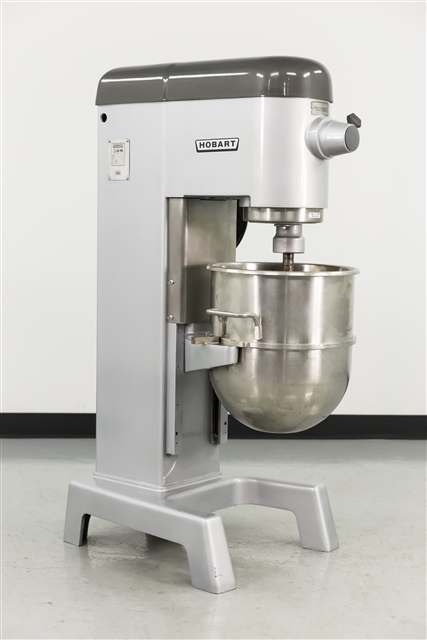 This used Hobart Dough Mixer was tested by our in-house service technicians. They plugged it in, testing the electrical components to ensure they are working properly, and that no connections were shorted or frayed. They then tested all mechanical and safety parts, including the transmission, gears, and stop/start button, and the gear housing oil was changed. The technicians then added dough to the mixer to ensure that it mixes properly and consistently. This used Hobart D340 Dough Mixer passed all quality control tests and is in good condition. The used price for this item is $3,995 – a similar sized new Hobart mixer would cost more than $8,000. Your business could save hundreds of dollars by purchasing used restaurant equipment from Burkett! We currently have an inventory of more than 70 used pieces of equipment in our Perrysburg showroom and online at www.Burkett.com. With so many categories, your business is bound to find the equipment you need at an affordable price. Want Fries With That? 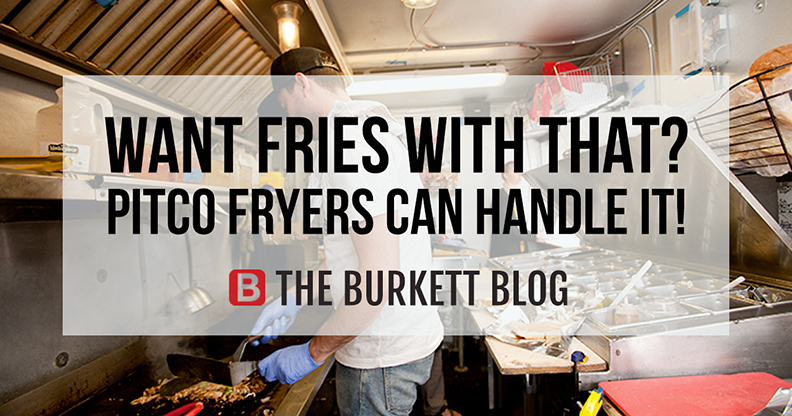 Pitco Fryers Can Handle It! With low maintenance and cost of ownership, commercial frying equipment from Pitco has been a reliable and versatile leader in the industry for more than 80 years. Pitco Solstice Series Fryers allow you to cook more product, more efficiently, with an improved operating environment featuring cooler flue temperatures. Each model in the Solstice series is the same depth front to back, so that you can easily order and build a standard battery of fries to meet your unique needs. Pitco also designs for serviceability – they’ve reduced the number of parts, and the fryers are serviceable from the front. 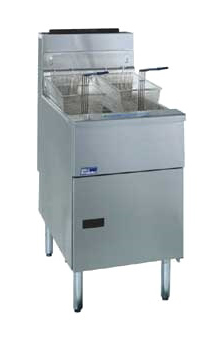 The filtering process improvements eliminate steps, so that fryers are easier to clean and return to service faster. The Pitco 35C+S Gas Fryer is perfect for places that serve smaller items, like appetizers, for quick batch cooking and serving. It features stainless steel construction and a welded tank with an extra smooth peened finish for easy cleaning. At 90,000 BTUs this fryer uses long lasting, high temperature alloy stainless steel heat baffles mounted in the heat exchanger tubes for maximum heating efficiency and combustion. It also features a millivolt thermostat to maintain the selected temperature automatically between 200oF (93oC) and 400oF (190oC). For larger frying needs, Pitco Solstice Fryers are available in up to a 90lb gas fryer size. The Pitco SG18S 90lb Gas Fryer features a dependable blower free atmospheric heating system for fast recovery. The Solstice gas fryer comes standard with a millivolt thermostat with a thermo-safety pilot, high temperature safety limit switch. The unique Solstice burner and baffle design increases cooking production, lowers flue temperature, and improves the working environment. 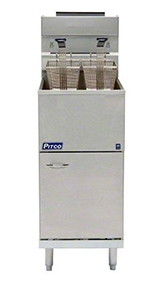 Take a look at all of the Pitco models that Burkett Restaurant Equipment has available! Many are available to Quick Ship within 3 business days. 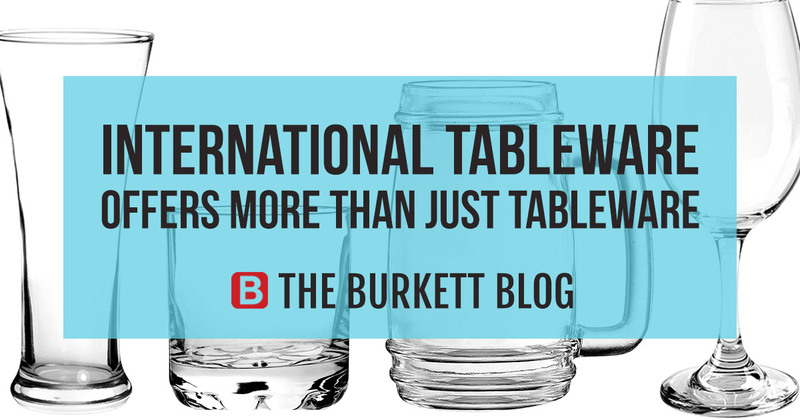 International Tableware (ITI) is reliable and direct source for high quality tableware, but they make more than just tableware. ITI creates a variety of innovative, quality products that help to fulfill the needs of each and every customer, and Burkett Restaurant Equipment is proud to provide you with a full line of ITI products. One of the most popular of these lines are ITI glasses. 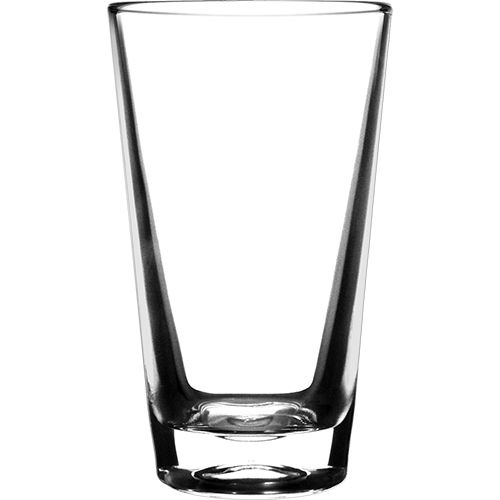 These glassware items are attractive and strong, and can stand up to daily use in the busiest of commercial environments or catering events. Whether you’re looking for shot glasses, goblets, rocks glasses, cordials, Irish mugs, or juice glasses, International Tableware has the glasses that will meet your needs. Thermal Shock – Thermal shock can occur when glassware is subjected to a sudden temperature change (either hot or cold) and it can cause enough stress to result in breakage. To avoid possible thermal shock, glassware should always be returned to room temperature before it is used again. Mechanical Shock – Breakage or chipping due to mechanical shock is typically the result of sharp contact with another solid object (this can include a countertop, another glass, dinnerware, or flatware). It is not uncommon for mechanical shock to create a minor crack in the glassware. This glass item becomes more susceptible to breakage whenever it encounters mechanical shock, or a thermal shock. The best way to avoid mechanical shock to your ITI glassware is to avoid placing flatware into a glass, and avoid nesting glasses together unless they are specifically made for stacking. Breakage – Stacking glasses causes unnecessary stress on these pieces, so don’t stack pieces to avoid breakage, scratches, chips, or cracks. Look into getting a glass rack for extra space and organization if needed. Keeping these tips in mind can help keep your glassware in good working condition. With proper care and handling, your business can avoid common glassware problems. For more ITI products, head over to the Burkett Restaurant Equipment website. Commercial sandwich grills have a home in many food service businesses. They are used at any time of day for any number of menu items. With features such as varying grilling space height, adjustable temperature, and easy cleanup, a sandwich grill is a good choice to add to your kitchen. 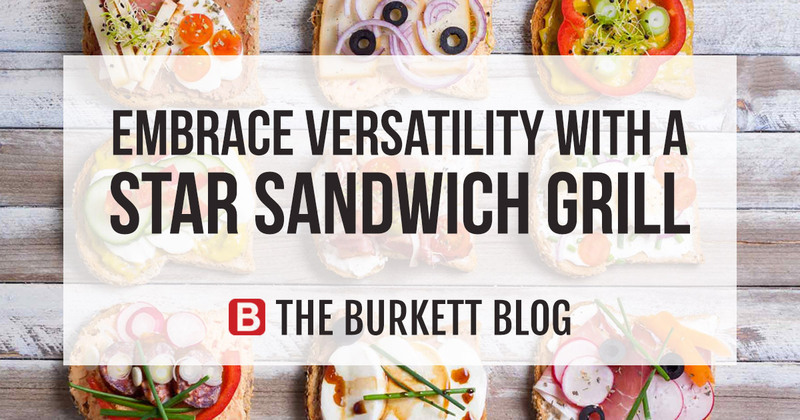 Burkett Restaurant Equipment offers the Star brand of sandwich grills, known for quality and reliability in the food industry. With options such as aluminum or iron plates, single or double grill, Star offers countless sandwich grills that will fit with your business’s needs. 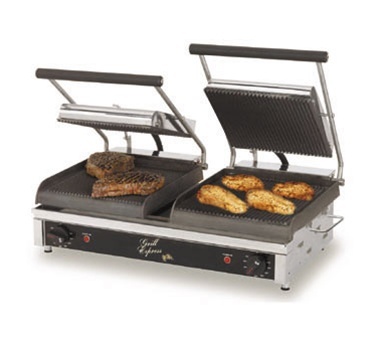 The Star GX20IG Sandwich Grill is a split-top unit constructed of 20-gauge stainless steel. It has heavy-duty grooved cast iron plates that can accommodate up to three inches of food. This amazing design provides longevity and superior performance to meet all of your menu requirements, including sandwiches, tortillas, wraps, steaks, chicken, fish, and more! The thermostat of the Star GX20IG is rated from 175°F to 450°F and it provides accurate sensing of temperature. Embedded elements located in the cast iron plates means superior heat distribution and fast recovery. This sandwich grill has a reliable hinge system which provides effortless operation and it is designed for even pressure on both sides of the product for consistent heating and searing of your chosen food products. The bottom plate has a patented ¾ inch splash guard corral which offers maximum protection against grease spills. A removable grease trough allows for easy clean-up. A heavy gauge, water resistant, and flexible plastic conduit protects electrical connections, and a large heat resistant handle means safe operation. Burkett Restaurant Equipment is proud to offer the Star GX20IG Sandwich Grill and a wide variety of other Star Sandwich Grills. A good sandwich grill is easy to use, easy to clean and easy to add to your kitchen for your guests. Star Manufacturing prides itself on creating high-quality, reliable, and durable commercial kitchen equipment since 1921. They are a popular choice among U.S. stadiums and arenas, as well as among those in the catering industry. Burkett Restaurant Equipment sells a number of Star Manufacturing products from ovens to griddles, and from hot plates to popcorn machines. 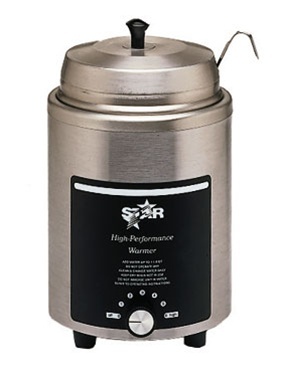 One of their most popular food warmers is the Star 4RW-4H 4 Qt. Round Food Warmer. sire and includes a Hi-limit thermostat which prevents overheating. Best of all, the Star Round Food Warmers keep your food at the right temperatures until you’re ready to serve them, and it does so without taking up a lot of counter space. This amazing food warmer can effectively keep a variety of food products warm including chili, gravy, hot fudge, and – of course – soup! At such a low-cost, these can be added in multiples and do not take up much counter space. 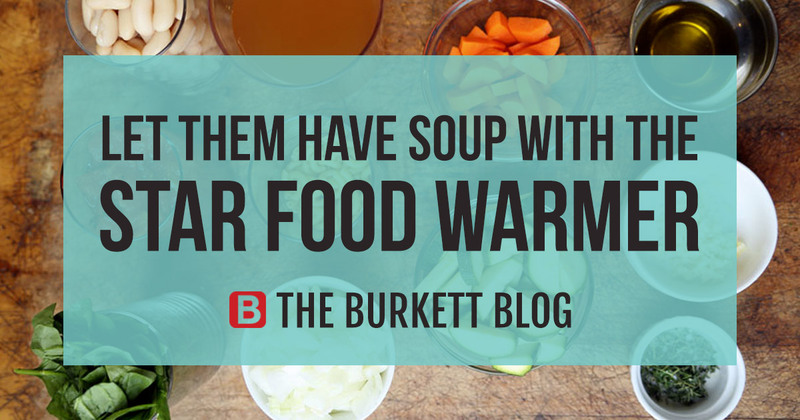 Burkett Restaurant also sells additional specialty items like the Star Spout and Pump Warmers and Star Well Warmers that are perfect for warming sauces, cheese, or condiments. These warmers are great for outdoor arenas, ice rinks, and other places with colder or inconsistent temperatures. The product will dispense correctly and at a safe temperature for your guest to consume, each and every time. Consider a food warmer as your next purchase and addition to your business. These great items will add variety to your menu, and offer more options for your guests.